It seems like every year, fair food is getting more and more creative. Whether it is a deep-fried-junk-food-on-junk-food or a previously seemingly inedible food, fair concessioners have been keeping our tummy’s on our toes! Read below to find out what you can expect to be eating at next year’s fair (or this year’s fall fair). This seeming twist on two American classics, the doughnut and ice cream, is actually a Hungarian traditional pastry filled the sweet or savoury filling of your choice. Pictured above is the a pastry cone filled with soft-serve ice-cream, aptly named a “Chimney” by Eva’s Originals, but fair-goers can also choose a “chimney-dog” option, a hot-dog filled pastry. 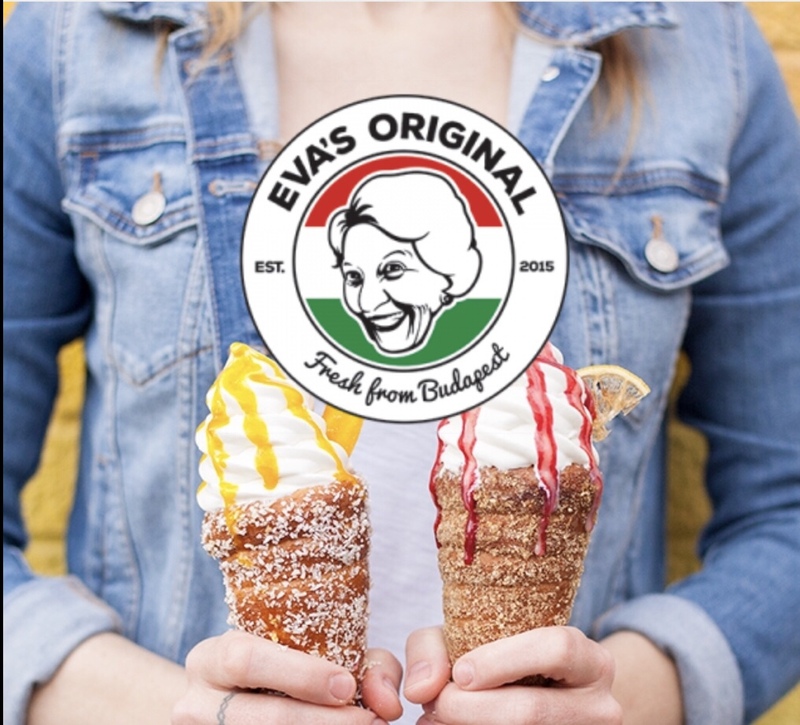 Eva’s Originals has appeared at Markham Fair, and can be found at fairs across Canada thanks to their food-trucks and their four Greater Toronto Area store locations. Fresh from Budapest! Would you rather… eat the same-old-same-old fair food or, would you rather, take the leap and eat chicken feet? It certainly is not as bad as you are thinking, CoCo’s Concessioners make sure to fry their chicken feet in a tasty batter and remove the claws. Thanks guys! 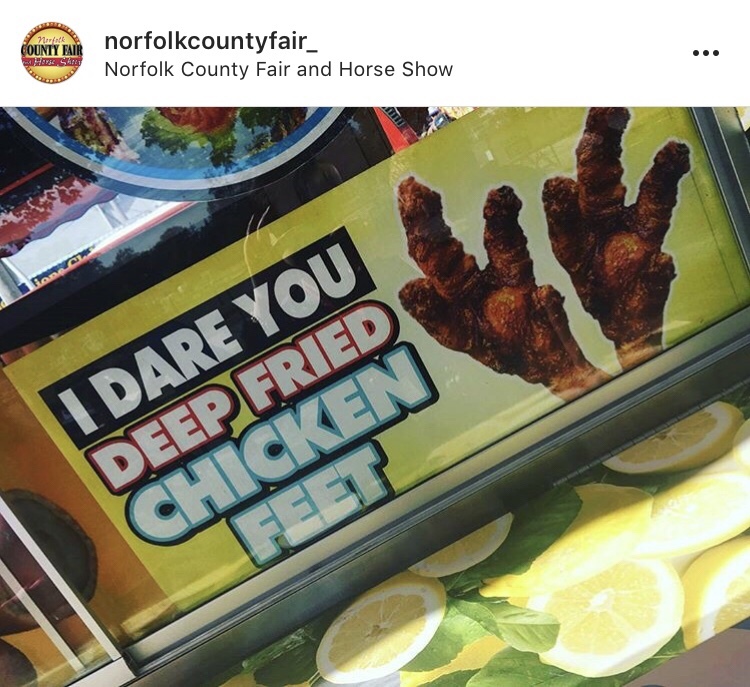 But, in all seriousness, if this is something you think you would do, check back at the Norfolk County Fair to see if they will pop up there in October. 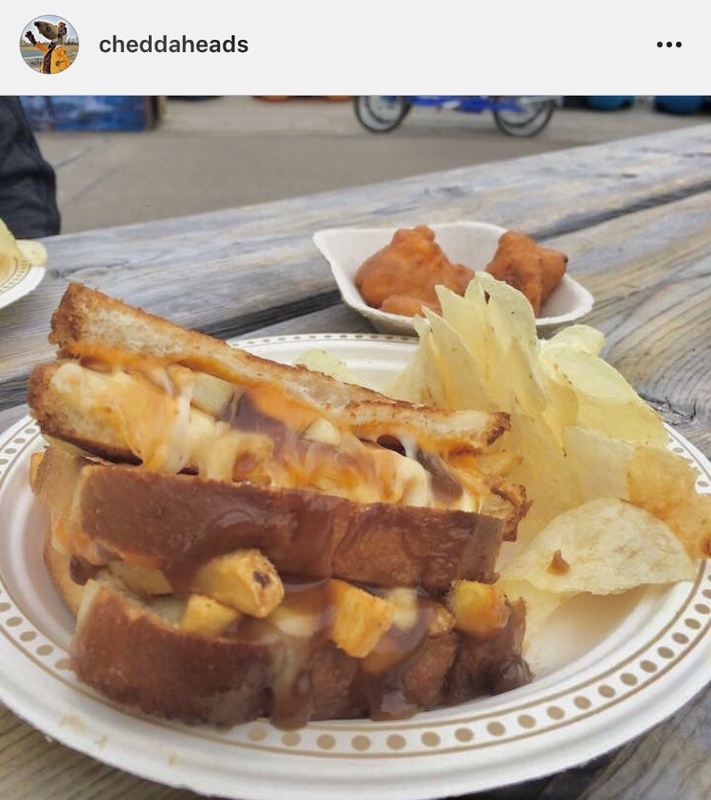 Finally something every Canadian can agree upon: the only valid way a grilled cheese can be improved is to stick a poutine right-smack in the middle of it. Chedda’ Heads keep getting it right with sandwiches like this one, christened the “Sorry Not Sorry”. Their Grilled Cheeses are grilled, served up with a side of chips, and delivered to you at fairs across the country out of their truck. They recently popped up at the Westerner Days Fair, but can also be found at their location at Bower Ponds Recreation in Red Deer, Alberta. You would not think that something named after Shrek would be so delicious, but Monster Cones “OgreCone” likewise is huge, layered and easy to love. 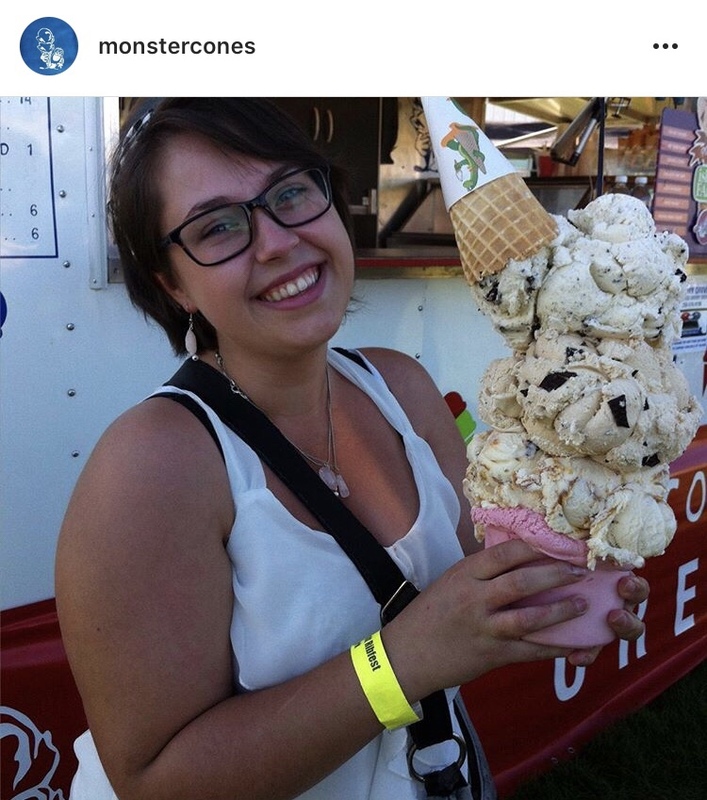 Popping up at Strathmore Stampede, Monster Cones was a success, people trying (and likely failing) to conquer the monstrous ice cream cone by themselves. Our online advice to readers willing to take on this fair-food challenge, is to do so with two hands! The most insane part about this surf-and-turf poutine is the sheer caloric-intake a person undergoes eating it. Not that calories ever hold us back from indulging in yummy fair foods, YOLO and YFIOOAY (Your Fair Is Only Once A Year), right? Did you see that sauce hiding in there, by the way? Yes, that is hollandaise. 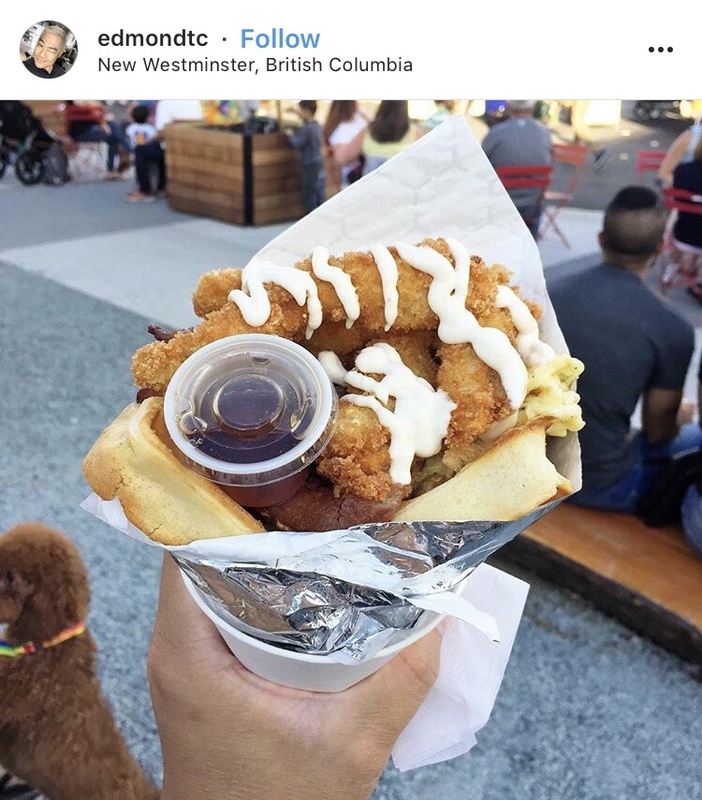 Start Googling True North Eats right now to find where their food trailer will show up next (Richmond Fair again, perhaps). Their cafe location in Ottawa is currently closed for repairs to their ventilation system. Who would not want to eat these bowls? If we could bring Thanksgiving with us everywhere, I am sure many of us would. 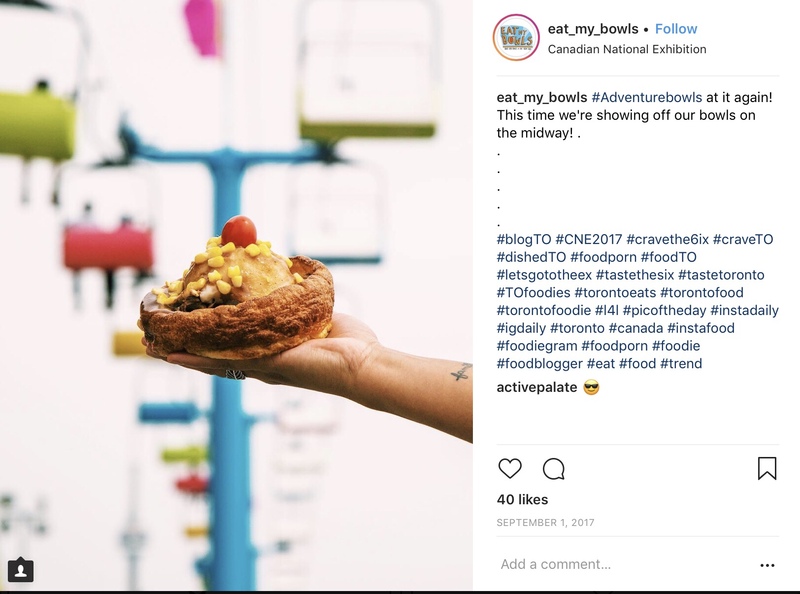 Eat My Bowls is making that possible from their food trucks at Ancaster Fair and other locations across Canada. The Thanksgiving-themed bread bowls contain sliced turkey, mashed potato, gravy, and are garnished with corn and a cherry tomato. If you love peanut butter, you love Peanut Butter Cupboard, simple fact. The masterminds behind this kabob, took a classic PB&J and deep-fried it and then added some deep-fried Reese’s cups–just because science makes it possible. These guys were at the Calgary Stampede, K-Days Fair, and travel to other fairs on their food truck. Their truck contains exclusively peanut-butter themed treats, like the kabob or their “The Elvis” special. 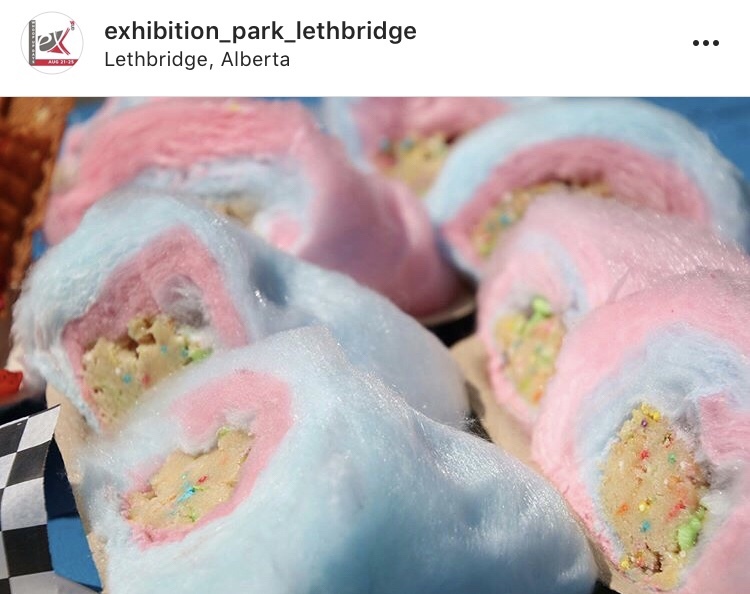 Cookie dough has barely been an safely edible thing for very long, but Family Dough is already serving up innovative and delicious treats like this cookie-dough-stuffed cotton candy at events like Whoop-Up Days across Canada and even the United States. That’s right, in addition to having trucks and store locations in both Edmonton and Calgary, they can also be found mobile in Phoenix, Arizona (in case you need your fix while on vacation). Their cookie dough is raw, safe and ready to eat. All we can say to this is, yes, yes and yes. Chicken, yep, waffles, yep, portable cone, yepppp. Beljam’s Waffles stunned Cloverdale Rodeo and travel to various fairs and events around Canada. Can’t say no to extra protein? 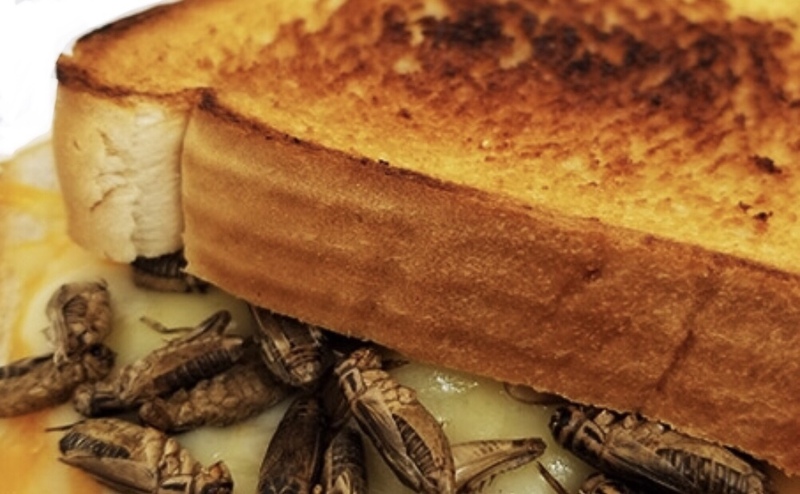 This cricket stuffed grilled cheese is for you. Melt Town serves up a variety of creative grilled cheeses, including this trendy item from their truck. Think you would never chow-down on this sandwich? Think again, crickets are becoming a popular health-food option, available even at boutiques and larger grocery stores across Canada. 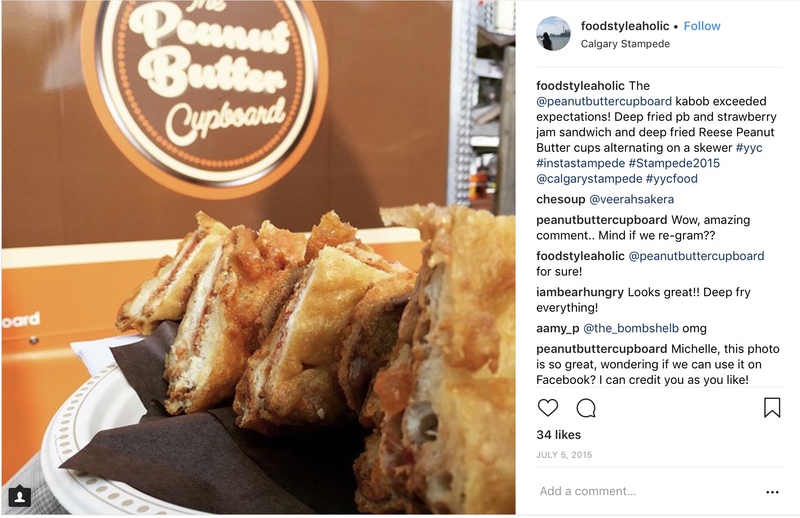 This sandwich was featured at many fairs including the Queen City Exhibition in Regina, SK. 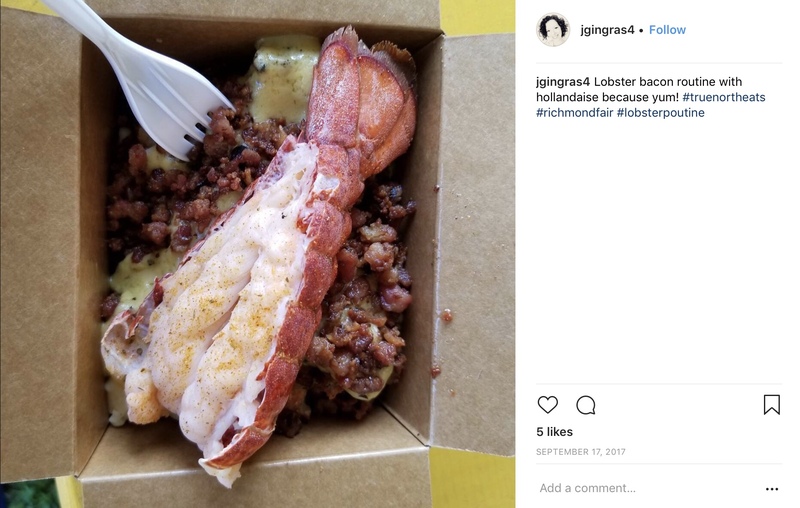 These are just some of the craziest foods you can try at Canadian fairs – what else have you seen this year? Comment below! Would you like to know more how your province’s safety standards may be affected by the ASTM? Are you curious about licensing practices as they shift from province to province? Read on! by Bill Church, Manager, Health, Safety and Security at the Calgary Stampede and CAFE representative on the Amusement Device sub-council. As part of the inspection code harmonization across Canada, Alberta has recently adopted the American Society for Testing and Materials (ASTM): ASTM-F2783-14 standards for amusement ride inspections and maintenance. For reference, Northwest Territories, Quebec, Newfoundland and New Brunswick all still use the old Canadian Standards Association Standard, while British Columbia, Saskatchewan, and Ontario are using the ASTM Standard. This code is more comprehensive than the previous CSA standards. 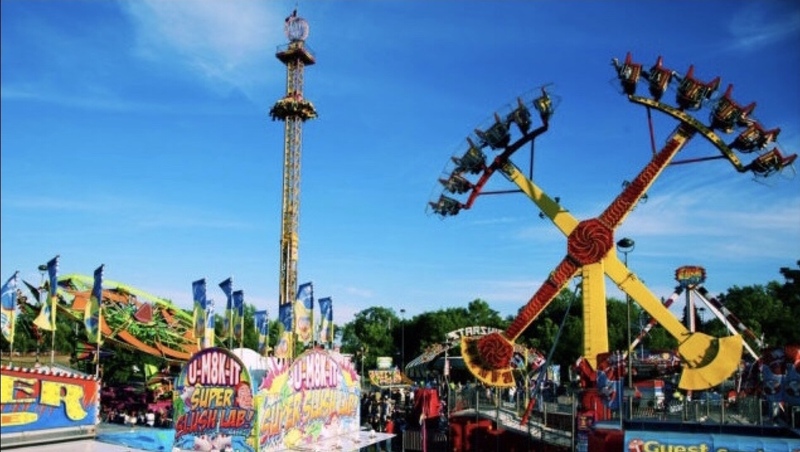 Alberta Elevating Devices and Amusement Rides Safety Association (AEDARSA) is the delegated safety administration in Alberta and has trained their Safety Codes Officers in the new inspection standards. The latest version of the ASTM standards was published in November 2017, and will come into force On Dec 1, 2018, unless the Alberta Minister of Municipal Affairs requests a different date. The new ASTM code includes new referenced standards for trampoline courts, bumper boards, aquatic play equipment, railway ride devices, parasailing and stationary wave systems – all currently unregulated in Alberta. If adopted as published, this will be a significant change, as currently Alberta policy regulates only amusement rides that have mechanical systems “externally controlled” by an operator and does not currently regulate patron-controlled or muscle-powered devices. The recommendation will be based on stakeholder consultation, internal review and analysis for all of these new devices. The fair industry is still adapting to the new ASTM standards, so another change to the regulations may require additional resources from our members. One of the items of attention with the Minister of Municipal Affairs is the risk associated with trampoline parks. There was a fatality at a trampoline park in British Columbia in January 2018, and from United States statistics, 14,000 people were reportedly injured at trampoline parks in 2016. Inquiries have been made with Alberta Health Services to determine the magnitude of incidents in Alberta related to the devices that may become inspected and regulated using the ASTM standards. This will help influence the decision regarding which activities to regulate. Currently no provinces and only a few US states have any regulations in place for trampoline parks. The Alberta Safety Codes Council’s Amusement Rides sub-council will need to make a recommendation to the Minister in the summer of 2018 whether to adhere to the proposed schedule or for sooner or delayed implementation of the ASTM. As the CAFE representative on the Amusements sub-council, Bill Church would be interested in hearing from businesses regarding these upcoming code changes. Share this update with any local businesses that may currently not be members of CAFE but could be impacted by the new standards. Amusement ride installation and licensing is currently regulated by the Technical Standards and Safety Authority (TSSA) and the Technical Standards Safety Act in Ontario. This Act regulates any “amusement devices” that “entertain a person by moving them”. Similar to Alberta, Ontario does not include certain devices like passenger controlled rides, zip lines, slides, and go-karts that cannot attain high speeds (less than 2m/s and 4km/h). Nevertheless, only one major injury has been reported in the last ten years due to go-karts, a go-kart incident caused by non-licensable private use. There is currently no federal standard for collection and compilation of injury reports, so this number of injuries could potential be higher. Amusement device permits are dealt with at a provincial level. Business owners must create a dossier, including manufacturer’s recommendations and inspection report by an on-staff mechanic, and present this to a TSSA director. This dossier regulates the number of inspections required and contains proof of a minimum of two (2) million dollars in liability insurance. After approval by the director, the device undergoes an additional “initial” inspection at a cost of 145 dollars (or more) and at least 318 dollars for the license. In addition to having a mechanic on staff, the Act requires that each operator/attendant have “sufficient training”, which the business owner must attest to in a signed document. Staff and contractors are responsible for performing the recommended number of inspections, where unacceptable conditions include incidents such as fire, injury, and also vandalism. Incidents such as these must be reported within twenty-four (24) hours of discovery and stall device operation until its next inspection. In 2016, the TSSA reported making 2000 inspections at amusement parks around Ontario. The Elevating Devices Safety Regulation (EDSR) chapter of the Safety Standards Act is what currently legislates operation of amusement devices in British Columbia. The qualifications and licenses required of contractors who install amusement rides is found under the Safety Standards General Regulation. Regulations for amusement devices, certification requirements for operators of elevating devices, passenger ropeways, and lifts for persons with physical disabilities are found in the EDSR. The Act was amended in 2017 after concerns in 2016 about lack of regulation and injury caused by zip lines, “passenger ropeways”. Several news reports cited a ride in zip-line injury rates in 2015, taking statistics from the United States: that 16 850 people were injured between 1992 and 2012 by zip-lines but that seventy (70) percent of these occurred from 2008 onwards. The last major zip-line injury in British Columbia occurred in 2011, later attributed to staff error. Bungees and go-karts are another two items that are not included in the EDSR. There are, however, special specifications for “kiddie automobile rides”, bumper cars, and “circular” and “rotary” rides. In 2015 the BC Technical Safety Authority reported conducting more than 350 inspections at a standard rate of 167 dollars. Installation inspections and permits range between 300 dollars to 1200 dollars, depending on size and type of amusement device. Larger parks, including the Pacific National Exhibition, report that they have more than three independent inspectors do daily inspections at their parks, and conform to the American Society for Testing and Materials (ASTM) standard. The Amusement Ride Safety Regulations Act (ARSRA), amended January 2018, now includes a Technical Safety Authority of Saskatchewan (TSASK), Ministry of Government Relations, and amusement ride owner collaboration and revision. Saskatchewan conforms to a North American Standard (American Society for Testing and Materials standard) of amusement device safety that Alberta hopes to implicate in December 2018. However, despite ASTM recommendations, Saskatchewan is the only province to explicitly exempt trampolines from their legislature. TSASK affirms that empirical data and statistics from the United States have shown injury to often be caused by user error. Water slides are also exempted from the ARSRA, regulated by the Ministry of Health. The Act gives special considerations to issues such as guards/fencing around rides, walkways, and dark rides. A section is also dedicated in specific to go-kart safety, adopting ASTM- F2007-12: Standard Practice… Operation of GoKarts. Business owners must register their amusement ride design with TSASK and undergo inspections prior to obtaining amusement ride licensing. Inspection services are conducted at a fee of 155 dollars, and licensing is granted for between 117 and 468 dollars, depending on the size and type of the amusement ride. In 2016 TSASK reported licensing 386 Saskatchewan amusement rides and conducting 350 inspections. The ARSRA also requires a minimum of two (2) million dollars in liability insurance. It requires that ride operators be trained, familiar with the ARSRA, easily identifiable/uniformed, and of a minimum age of sixteen (16). In Manitoba the Office of the Fire Commissioner (MOFC) is responsible for inspections/licensing of amusement rides. MOFC published a review of the Technical Safety Act in 2016 which was the current standard of safety for amusement devices. The review proposed changes to ride safety standards and appealed to the public to share their views on the standard. Among their proposed changes were: the issuing of permits for amusement devices upon initial installation (which thereupon could be renewed upon each relocation/sale of the ride). The MOFC also called for regulation on zip lines and waterslides. In 2016, one amusement ride incident that left two people either injured or hanging dangerously from a ride. Another 2016 incident in a water park caused three students to be injured by a damaged waterslide flume. The MOFC’s proposed changes moved to adopt the American Society for Testing and Materials (ASTM) standard from a Canadian Standards Association (CSA) code. The resulting 2017 Amusements Act, which legislates amusement rides, devices that “entertain or amuse people by physically moving them”, is rather concise. It has small sections that cover that rides must be safe, inspected by the Department of Family Services and Labour, issued a safety certificate, paid for in fees, free from incident, and are exempt from civil prosecution. Fees have not been included in the 2017 amended version. Under the Regie du batiment Quebec, amusement park rides are kept up to the Building Act, Construction Code, and the Safety Code. The first two Acts regulate contractor licensing and building requirements. The Safety Code legislates business owners in terms of safety measures, recommended number of inspections, and fees. For example, business owners must post signs, alerting passengers of height and behaviour requirements (i.e. restraining hair and hands to inside the ride). Wherever possible, owners must supply passenger restraints for amusement devices. Owners are also responsible for amusement device inspection and maintenance like ensuring the devices are inspected to the recommendations of the manufacturer and of the Construction Code. Certain damages to ropes and links like fray and cracking mandate replacement by law. Once all of these requirements are met and a two (2) million dollars liability insurance is obtained, owners may apply for device permits at a minimum of 60 days before operation. Permits are issued at a cost of 327 dollars, 387 dollars for “flight” devices, and 81 dollars for permit renewals. The scope of the act does not cover go-karts, waterslides, bungees, and zip lines. 2016 was the last reported case of injury from zip-lines, accounted for by human error. There are however special provisions for roller coaster, flume, and dark rides. Nova Scotia legislates its amusement rides under the Amusement Devices Safety Act. Amended in 2015, this Act includes the Canadian Standards Association (CSA) specifications, like one (1) million dollars liability insurance. It also exempts “passenger ropeways”, zip lines, and certain “elevating devices” that conform to CSA standards Z-98 and B-44. No significant injury in Nova Scotia has been reported in the last five years for amusement devices and zip lines. After an initial inspection of the ride and granting of a new license, business owners pay a nearly two-hundred (200) dollar fee (125 dollars each year thereafter). These fees must be paid before the ride may be operated. Incidents and failed inspections can be appealed by business owners or heard by the Chief Inspector. If culpable of neglect or other offences, fines are capped at five (5) thousand dollars or two-hundred (200) thousand dollars for corporations. Prince Edward Island regulates under its Amusement Devices Act, amended 2015. The Act has certain exemptions like water slides and special considerations for go-karts and welding requirements. Only one serious report of injury has been brought to public attention recently; in 2015 a family was injured by a malfunctioning ride. PEI conforms to CSA standards with requirements for a minimum of one (1) million dollars liability insurance. The act specifies that at least daily inspections should take place on the device by competent staff. Yearly inspections occur with the renewal of its certificate at 110 dollars fee, and the owner must supply the labour, materials, tools, equipment for this inspection to take place. New Brunswick mandates a CSA standard for amusement device operation in its 2015 amendment. Under the Elevators and Lifts Act, amusement devices are to be registered, inspected, scheduled for set-up, and issued a certificate by the Minister of Safety before operating. The only listed device exceptions in the Act are non-profit or coin-operated devices, defining amusement devices “as intended to entertain or amuse people by physically moving them.” The last reported amusement device injury in New Brunswick was 2013, a waterslide incident, where an employee allegedly forgot a step to properly set-up the slide. Business owners are responsible for hiring “competent” mechanics and operators, that may be questioned by outside inspectors at any time when they enter parks/facilities ($100/hour). Notice must be given to the chief inspector within twenty-four (24) hours of any injury or incident with the device. In Newfoundland and Labrador the Public Safety Act (Regulation 118/96: Amusement Rides and Elevating Devices) requires the registration of designs before installation or alteration of any amusement device. These devices include any structure or machinery to amuse people by moving them, except special cases where exemptions are granted by the Chief Inspector. Inspections must be done upon installation and before use by the public. Each year business owners are responsible for notifying the Chief Inspector in writing of need to renew their license— with proof of up-to-date one (1) million dollars liability insurance. At this time legislation of amusement rides in the Yukon, Nunavut and the Northwest Territories is either minimal or non-existent. Yukon business owners may refer to the Elevator and Fixed Conveyances Act for information on safety standards (ASTM standard) and fees ($50-$150).